A sizable chunk of a mammoth tusk has landed on the University of Oregon campus, several months after a hired hand on a northeast Oregon ranch thought he saw a petrified log sticking out of a hillside overlooking Ione High School. A UO team led by paleobiologist Ed Davis, assistant professor of geological sciences, excavated the tusk Oct. 5-6 from the property in Morrow County. "It turned out to be a pretty nice piece of tusk, probably a mammoth tusk," said Davis, who also manages the paleontological collection at the UO Museum of Natural and Cultural History. "It is about 8 to 10 inches in diameter, and we got probably between 10 and 15 inches of tusk preserved." The exact measurements won't be known until the "very fragile" tusk is removed from a plastic jacket that was molded around it to preserve its integrity during the removal process, Davis said. The connection that eventually brought the tusk to the UO occurred after a spring baseball game between the Ducks and Oregon State University Beavers, said Dale Holland, a mathematics and advanced science teacher in the Ione School District. Holland already had consulted a geologist at Eastern Oregon University, where he had earned bachelor's degrees in chemistry and education, about how to safely extract the suspected tusk, but finding the time had been a big challenge. While walking on the UO campus after attending the baseball game, Holland said, he crossed paths with Bethany Morter, a 2011 Ione graduate whom he had taught in a science class. Morter, one of 15 members of her graduating class, now is a UO junior majoring in geology. "She was just getting out of a night class and was headed home," he said. "I asked Beth if she could talk to her professors to see if someone would be interested in doing a joint excavation with my class on the tusk." Morter said that she told Professor Greg Retallack, who was teaching the Geology 203 class she was in at the time, about her encounter with Holland. Retallack, in turn, talked to Davis, who then contacted Holland, asking him to send photos of the suspected tusk. 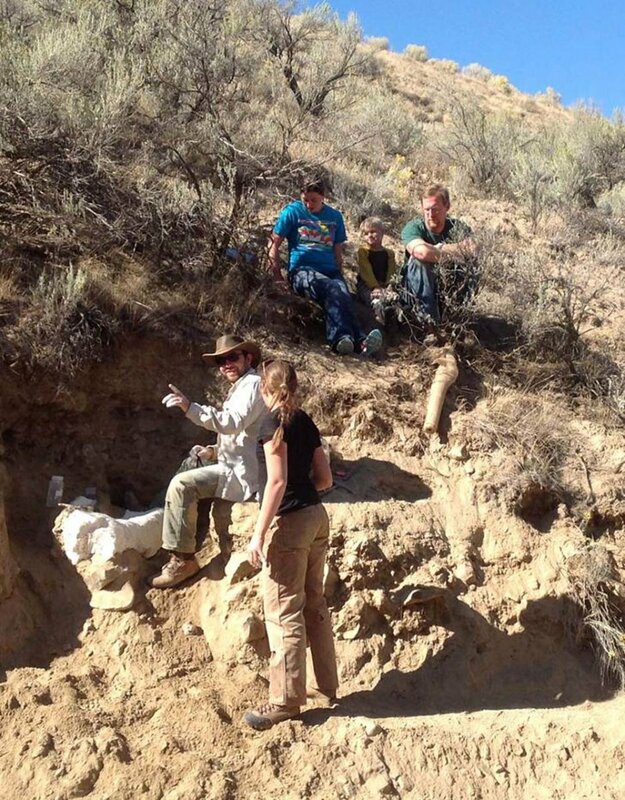 Davis went to the site accompanied by UO graduate students Nick Famoso and John Jacisin, who are studying vertebrate paleontology, and Amy Nelson, who earned a bachelor's degree in anthropology in June from the UO. Also tagging along was Davis' four-year-old son. Together with members of Holland's science class, the tusk was excavated. The full story began in the spring when ranch-hand Sergio Rodriguez found something protruding from soil as he was moving cattle on land leased by Joe McElligott, a board member of the Ione Education Foundation. "I was originally contacted about a petrified log sticking out of a cut bank up the canyon behind our school," Holland said. "One of our school board members, Bill Jepsen, said the description suggested a mammoth tusk." Jepson's family had unearthed a tusk on family property when Jepson was a child, Holland added. The next day, Holland, Jepson, McElligott and Rodriguez returned to the site. "We all agreed, it was probably a tusk," Holland said. Also found in the soil near the tusk, according to the Ione student newspaper, were teeth, "one from a prehistoric horse; the other from some sort of carnivore." Holland added that he was "honored to house" Davis and his team during the weekend excavation.